Well, here we are. The end of our island story. Sawyer heads off to the well to scope out the situation, and is captured by Ben. But Sawyer manages to get away once he discovers that Desmond is gone. Desmond wakes up to Vincent licking his face, and we discover that he was rescued by Rose & Bernard, who have been living in isolation the past three years, away from everyone else. Locke shows up, and takes Desmond from them, and heads off with Ben. Back at the barracks, Miles finds Richard unconscious a few hundred yards away from where we last saw him. They head over to Hydra Island to blow up the plane. On their way over, they discover Frank, still alive, and floating on top of some live preservers. They continue over to Hyrda Island to get the plane, and Frank suggests instead of blowing it up, they just take off without Locke. Out in a clearing on the island, Jack & co. run into Locke & co. Jack knows that Locke wants to take Desmond to the Light at the heart of the island, and Jack thinks Locke is wrong about what's going to happen, so they all decide to head there together. They arrive at the Light, and lower Desmond down the waterfall to the bottom. Once Desmond gets down there, he sees a pool of water, with the Light inside. In the middle of the pool is a stone holding the water in. He pulls out the stone, the water and the light drain out the bottom, everything goes dark, and then a red light shoots up from the hole, and the island starts to shake and come apart. Locke tries to leave, but Jack attacks him. He punches him in the face, and realizes he can bleed, which means he's now mortal. 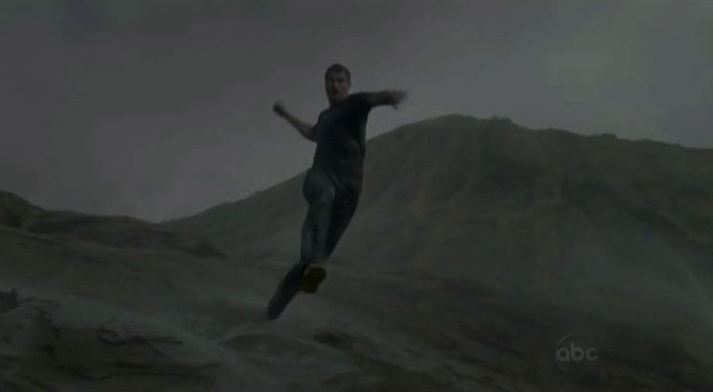 They struggle, but Locke hits him in the head with a rock and escapes. Frank, Miles and Richard try and fix the plane so that they can leave, and tell Ben on the radio to hurry up and head to the other island so they can leave too. Locke makes it to shore, where the sailboat is waiting for him, but before he can climb down the ladder, Jack shows up to stop him. They fight, which culminates in Locke stabbing Jack in the gut with a knife. But before he can finish the job, Kate shows up and shoots Locke in the back with her gun. Jack kicks him off the side of the cliff, and Locke falls to his death on the rocks below. Jack tells Sawyer and Kate to take the sailboat to the other island so that they can leave on the plane. Hurley and Ben both decide to stay and help Jack save the island. They got back to the cave of Light, and he has Hurley and Ben lower him down the waterfall. But before he goes, he names Hurley the protector of the island, knowing that he will die while saving the island. Jack goes down, finds Desmond, and attaches him to the rope so that Hurley and Ben can pull him up. Jack takes the stone, and puts it back into the hole. The red light disappears, and the pool refills with water, and the Light reappears. Hurley realizes that he's not going to see Jack again. He asks Ben to help him protect the island as his second in command. Frank gets the plane ready, and he, Miles, Richard, Sawyer, Kate, and Claire all are on board as it takes off. Jack wakes up in the jungle, and stumbles through the bamboo forest, the same forest he woke up in when he originally crashed on the island. He lays down on the ground, sees Vincent come through the jungle and lay down next to him, sees the Ajira plane fly off overhead, closes his eyes, and dies. But, we're not done. Some time after Jack dies, we see a Dharma distribution facility in Guam. They're putting together food shipments to send to the island. Ben appears, and tells them all he's shutting the facility down. When the ask why, he shows them a Dharma Orientation video for the Hydra Island, where we learn about their animal experiments, see the Hurley Bird's cage, learn about Room 23, and why pregnancy poses problems on the island. Ben closes up shop, then heads to Santa Rosa Mental Hospital, where he visits Walt. He tells Walt that he's here to take him back to the island. Walt agrees to go with Ben and Hurley, and they head off together, back to the island. The episode runs 65:08 and is 505MB to download. You can stream the episode below (via Facebook), or go here to use torrents (better quality, recommended) to download the episodes to your computer. On a side note, I decided in the end to include the DVD epilogue in this episode after all. I really wanted to separate it from the on island story, since Jack's death carried a certain finality to it. Ultimately I decided to treat it as kind of a 'hidden track' like you used to find on CDs. So I separated it from the rest of the episode, with about 20 seconds of silence. I felt it worked well enough to do the trick. I feel like the plane scene should have been split screened with Jack's walk through bamboo or maybe a bit before as well. It seems like they must have flown around in circles for a while before finally flying over Jack's dying body. I dunno, that really ruins the moment of the final image of Jack closing his eyes. Besides, we don't have any evidence that would give us a clear view of when the plane is taking off in relation to Jack walking through the bamboo, it would all be speculation.